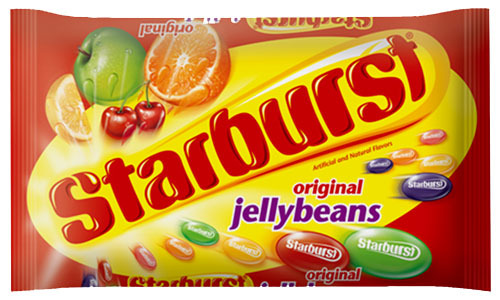 I am a tad addicted to Starburst JellyBeans- the “original” little jelly masterpieces. If Easter doesn’t come fast and get them out of the middle of the isle at Meijers, I will probably die of overdose. Seriously. So not kidding. If the stores would sweetly put out the holiday stash just before the said holiday – overdose would never become an issue. We’d have a big and wonderful splash of holiday sugar cheer and move quietly along. But no. The store isles are out to get me. The bags leap into my cart. I dont know how I come home with not one, but two, bags on grocery outtings, but I do. They mysteriously disappear and I want to say it is sooooo not my fault! See, the only time of year they put these precious beans out for sale is at Easter time. 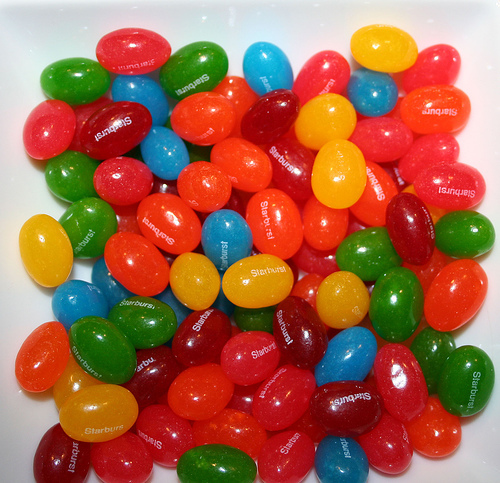 They even once discontinued making them because “jelly beans” are not huge in sales overall as a candy product. So they only put them out there when the sales are highest – can you guess when?? Right! Easter. So see – It’s not really my fault they cause me to feel the need to horde and get as much of these juicy and precious beans. It’s because they withhold them from me all the rest of the year. Plus – get this – they have zero fat. Wonder what else is on the list, now that you made me look at the back of the bag… Oh, no Sodium, no nasty cholesterol, and no ridiculous Vitamins or minerals. It doesn’t get better than that (as long as you leave out the fact that there’s a slew of sugar in it… sugar is energy and energy not burned is stored as fat. Okay – insert fingers into the ears and sing loudly – “LaaLaaLaaaaaa” I am sooooo not hearing that! Now, go do something besides reading this blog. It’s over. Done. Quit reading will ya…I can’t feed my face and type proficiently at the same time, and one of the two things must go… beans or blogging. As much as I love you – you just dont amount to a hill of beans. No offense, of course. Yes, I read em all!